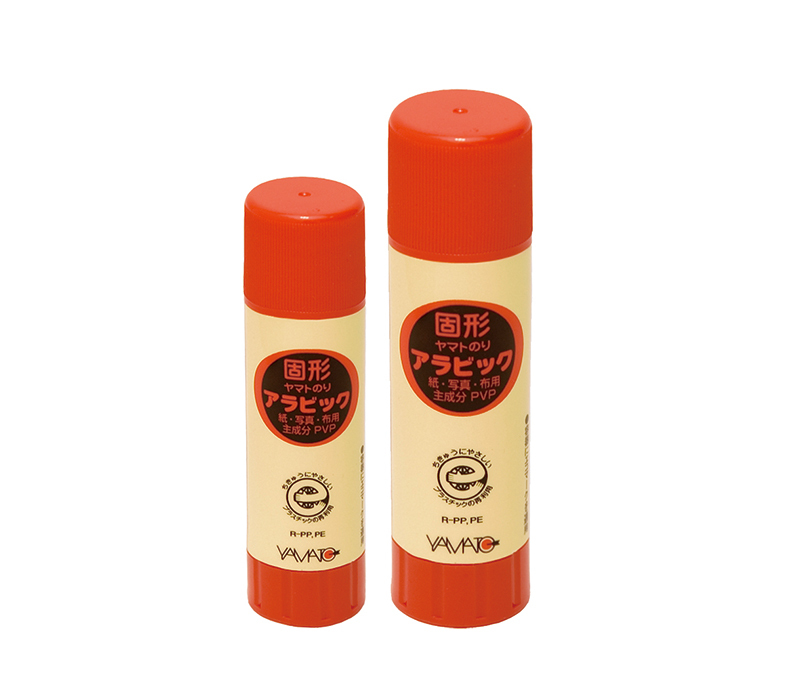 Shaped into a semi-solid stick shape, a glue stick lets you apply glue without getting any on your hands. It also makes it easy to control the amount of glue used, which is difficult to do with liquid glue. To use the glue, contained in a plastic tube, turn the dial-like knob at the bottom to push glue out of the tube like lipstick. The glue is a water-soluble adhesive comprising mostly synthetic resins such as polyvinylpyrrolidone (PVP). Fatty acid sodium added to the PVP gives it its semi-solid state, and glycols provide smoother application. Glue sticks are often used for bonding paper in office-related tasks or general crafts. To use glue stick, push 3 to 4 mm of glue out from the end of the tube and apply, holding the tube perpendicular to the bonding surface. To prevent air pockets from forming, gently press the bonding surfaces together from the middle, working outward towards the edges. When bonding together papers that differ in thickness, you may find it easier to apply glue to the thicker and sturdier of the two papers. When bonding together uneven surfaces like cardboard, however, it is better to use glue with a stronger adhesive force than a glue stick. Glue sticks are also sometimes used as an alternative to starch paste when mounting wood-engraving prints to heavier pasteboard. Paper bonded with glue sticks is generally less susceptible to wrinkles than paper bonded with liquid glue. However, there is no guarantee that work bonded with glue sticks will be free from wrinkles; avoid using glue sticks in high-precision applications where wrinkles are unacceptable. Glue sticks do not work well with paste-ups and other precise applications. Some glue sticks have coloring or are made for bonding materials other than paper. The coloring lets you see where the glue has been applied in order to prevent uneven application and fades as the glue dries. After you are done using a glue stick, wipe off any glue around the end of the tube and replace the cap to protect the glue from drying out. Glue sticks are available for purchase at art supply stores and stationery stores.